We are forging ahead making. yes we are each back in our known territories. 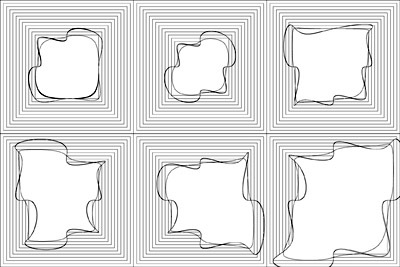 these next sets of drawings explore the possible edges of the perimeter sound within the sound bed box. they divide into 2 types: those that examine the spatial relationships between speakers, and those that explore the possible spaces produced by the speakers. (1) 2 drawings show possible mid/tweeter & woofer configurations. 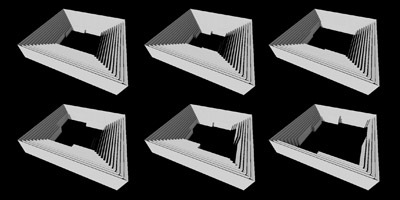 (2) 2 drawings depict the connections between sounds across opposite walls, suggesting openings within the space, or sonic bridges. 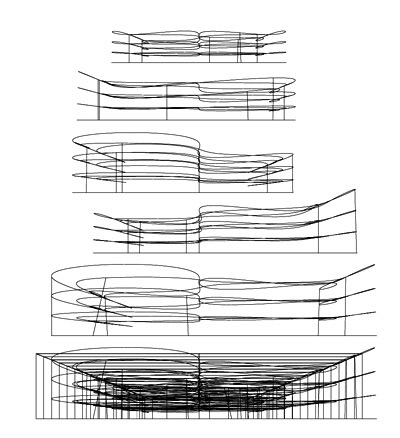 (4) 6 drawings show plans of the outer contours of various sound ripples. 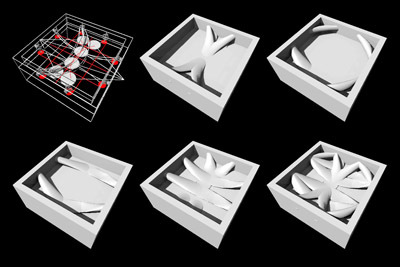 they take each midpoint and each corner of the perimeter walls as points along an enclosed set of splines, generating a rippling set of traces that grow outwards from the centre of the sound field. the box surrounding the listener implicitly grows and distorts, reshaping with each new emphasis. the drawing suggests both the erosion of a thick, insulative envelope and the steady growth of a charged void. (5) 6 sections show the same envelopes from the side. 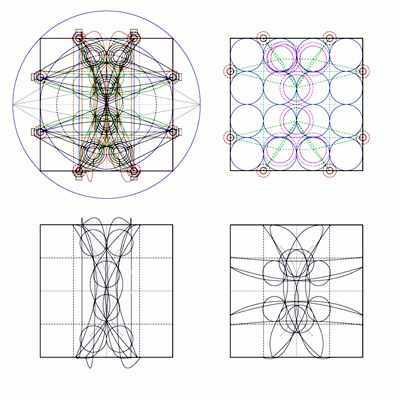 they might appear sectionally random but simply connect nodes at evenly distributed intervals with the simplest spline geometry. 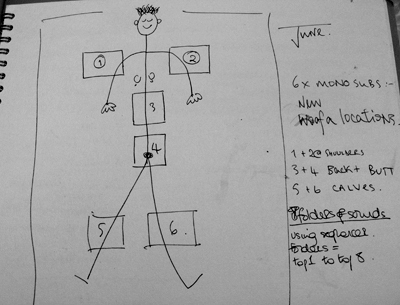 the lowest drawing shows them all overlaid with the wireframe of the box itself. each sound grows larger in height as it expands to become larger in plan. 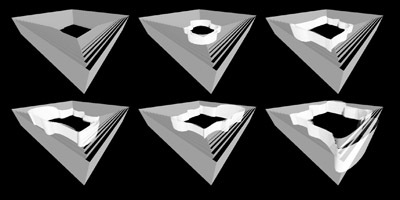 (8) a stacked set of separated sonic envelopes generated by 2 different b-spline geometries, defined either by through-points (the larger and more distorted curves) or control-points (the more moderate curves).